With there being two clear winners at the top of two conferences, the third and final to be decided came to a huge three-way dance for superiority! 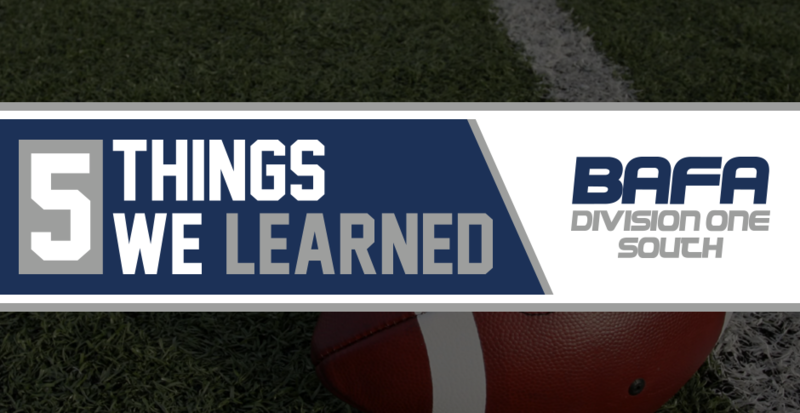 Here’s the 5 things we learned from all the Division One South action! When people read reports that the Bedford Blackhawks beat the table topping Titans White last game day on a last minute pick 6, you would think that they would be the new leaders in the Division 1 South Mid. However, they squandered their opportunity to take the top by losing out narrowly to Coventry Panthers on the same day. There’s social media buzz about refereeing calls, but we’re not going to delve into that. Everything gets left on the pitch! This meant each of the top 3 teams in the South Mid Div 1 all went 1-1 on the day, with Blackhawks remaining in third place after the Panthers loss. The Blackhawks host next game day, and the grudge match between them and the Titans is now more important than ever, especially now the Panthers have the advantage in the head to head over Blackhawks. Even if they win, it would make the head to head even more interesting as the top 3 teams would have a 2-0 advantage over the other one. Get your calculators out folks, this situation might get confusing. The Plymouth Buccaneers were the latest team to forfeit a game-day, in what’s becoming an alarming trend in the South West Division One. With Swindon already forfeiting twice, that’s now three game-days that have been truncated due to lack of players. Both the Falcons and Trojans were left with one game of the day, as both continued their fine seasons. We were lamenting how close the Coventry Cougars had come to their first win, but we didn’t have to wait long for the Ladies side to grab their first win of this season! And it wasn’t even close! A 57-0 destruction of the Northants Titans Black gave the Cougars their second win in the mixed BAFA leagues. The Opal Series champs are in their second year playing in the male dominated league, and have shown they can hang with the men. The South East division will be wrapped up in our next update – that’s pretty much assured. The Smoke are 8-0 with a 2.5 game lead over the Reapers, and two H2H wins. With the next set of games being a triple-bill for each side, the Smoke will be able to seal their division crown, and we’d expect them to. However away from the champs elect, the Reapers and Knights are in an exciting race for second place in the division, and if results fall their way, a likely promotion play-off battle. The Reapers went 1-1, while the Knights went 2-0 last game-day. It all comes to ahead at the next set of games, where both sides face off. The Reapers already hold a 31-20 win over the Knights, and need to hope the Smoke are focused and motivated to hand the Knights another loss if they’re to gain any daylight. A lot of questions are sure to be answered in the South East after the next set of fixtures! The Falcons have emerged from the South West as the most likely team to enter a promotion play-off scenario. With a tight win over the Celts, and the aforementioned forfeit victory over the Buccaneers, the Falcons sit at 6-2 with two games to go. They’ll be keeping an eye on results elsewhere, as they have little to no chance of catching the Trojans. Next for Exeter are the Hammerheads and Trojans – both sides have already beaten the Falcons in league play this year. Will Exeter cement their promotion credentials with a perfect day? We’ll find out at the next set of games!